These are “official” Hallmark 3 x 5’s. 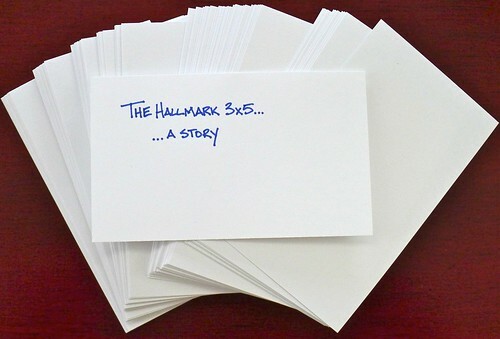 The story goes that the founder of Hallmark, J.C. Hall, asked the pressman to trim down the waste bits of paper into 3 x 5’s for him to write notes. He was seldom ever seen without a handful in his pocket and soon others were asking if they might have a stack. Now, there is no place in the company where you will not see a stack of these. Conference room tables always have at least one pile. Every desk has a stack so people can leave a note when you are away. Writers start ideas on cards and throw them in a bowl at writing review meetings so each bit of editorial is “anonymous”. Designers fold them in half and make mini-card thumbnail drawings. So, welcome to the world of Hallmark 3 x 5’s! What an awesome story Ana! Thank you so much for sending me these cards and allowing me to share the story behind them. I hope to do the cards proud! Posted on February 8, 2012 by Brad Dowdy and filed under Index Card.